Audi revises its Q7 4x4 | What Car? 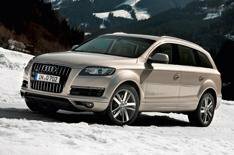 Its all change in the Audi Q7 range, with new engines, a new transmission and better economy on the way. Heading the list of changes is the introduction of two new versions of the supercharged 3.0 TFSI petrol engine, a new 3.0 TDI turbodiesel and the eight-speed automatic transmission first used on the new A8. The two TFSI engines replace the 3.6 V6 and 4.2 V8 petrol engines and, despite their smaller size, the new versions are not only quicker than the models they replace, but also have better economy and lower CO2 emissions. The 268bhp version powers the car from 0 to 60mph in 7.9 seconds, while in the 328bhp version that figure drops to 6.9 seconds. Both average 26.4mpg and have CO2 emissions of 249g/km. There is also a new version of the 3.0 TDI turbodiesel engine. Mated to an engine stop-start system, this engine averages 38.2mpg almost 20% better than the unit it replaces and emits just 195g/km of CO2, an improvement of almost 40g/km. It also gives stronger performance than the previous engine, hitting 60mph in 7.9 seconds. The 3.0 TDI Clean Diesel models continue in the line-up, and their low levels of nitrogen-oxide emissions mean they already meet 2014s Euro 6 emissions levels. However, although they are more economical than the old versions, they have higher CO2 emissions and less impressive fuel economy figures than the new 3.0 TDI models. The 4.2 V8 TDI also continues albeit with better economy and emissions as does the V12-engined model, although its economy and emissions are unaltered. The V12 TDI is the only model not to get the new eight-speed automatic transmission that is now standard across the rest of the range and plays its part in the better economy and emissions figures. This allows drivers to choose between Drive and Sport modes, as well as letting them change gear manually via the gearlever or optional steering wheel-mounted paddles. The full range is available to order now, with a choice of standard, SE and S Line trims, and prices from 41,260 to 54,055. First deliveries are expected in June.